Shockwave Lab, via their Weibo account, have uploaded images of their next upgrade kit: SL-45 LED Matrix Unit for Siege Voyager Optimus Prime. This is a very nice LED Matrix unit to the placed in the empty space inside Optimus Prime’s chest. It also integrates well in the alt mode. Small and as easy to install as just place it inside the figure. This is the third LED kit upgrade by Shockwave Lab, following the SL-44 LED Upgrade Kit For Masterpiece Movie MPM-05 Barricade and the SL-43 LED Upgrade Kit For Titans Return Trypticon we reported before. We still have no specific information on release date or price, but as usual with other Shockwave Lab products they should be out in the market shortly after they reveal pictures. Check out the images on this news post and then let us know your impressions on the 2005 Boards! Shockwave Lab Weibo has uploaded Images of another LED upgrade kit for the Masterpiece Movie MPM-05 Barricade. The SL-44 LED Upgrade Kit will give the Decepticon bad cop two great light effects. You have 2 options for the LED position: on the chest or over the shoulders. The kit seems easy to install and it will sure give you a great display option to show off Barricade on your display. No information on release date or price at the moment, but you can check out the images on this news post after the jump. Via TransFans On Facebook we have images of the next Shockwave Lab’s accessory: SL-43 LED Upgrade Kit For Titans Return Trypticon. This is an interesting alternative to improve your Decepticon Cityformer figure adding great light effects from Trypticon’s mouth and chest. We are sure your optics will be pleased with the result shown in the images. The kit is simple and we hope it’s easy to install as other previous Shockwave Lab’s upgrade kits. Check out the images on this news post and then share your thoughts on the 2005 Boards! The Studio Series SS-14 Ironhide is sure a very movie-accurate rendition of the Autobot Weapon specialist, but fans were not so happy with Ironhide’s front bumper being a single piece incapable of wrapping around his chest. 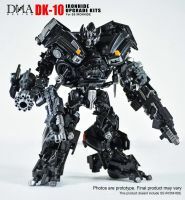 DNA Design has come to the rescue with their new DK-10 Studio Series Ironhide Upgrade Kit. This kit includes a new foldable bumper, and even more extra parts like new feet with ankle articulation, 2 extra rifles and 2 extra knives. The new weapons can be attached in robot or alt mode. The removal of the original front bumper requires you to take out a metal pin, but this kit also includes a practical pin-puncher to help you. We are sure your optics will be pleased with the final result seen on the attached images. We still have no specific information about price or release date, but stay tuned with TFW2005 for more information. Click on the bat and share your impressions on the 2005 Boards! 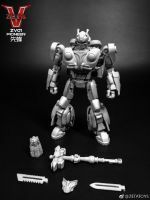 Zeta Toys on Weibo have uploaded images of the gray prototype of their new Zeta Toys Zeta-V ZV-01 Pioneer (Bumblebee Movie VW Beetle Bumblebee). This is a new line by Zeta Toys. Their first figure tries to recreate Bumblebee’s robot mode as seen in the movie, so he has no visible “door wings” on his back, they are folded over it now. This new toy includes several other accessories like a blaster, battle mask, battle hammer and 2 swords. 18 cm tall with die- cast parts. No alt mode images yet. We still have no specific information on the price, but the announcement indicates it is due to release on summer this year. Be sure to stay tuned with TFW2005 for more information when it’s available. This is the first prototype, so changes may be done in the future. Click on the bar to see the mirrored images and join to the discussion on the 2005 Boards. Weeks back designer Rick Akker showed off his design for an IDW Fortress Maximus. Weeks later, Mastermind Creations (via their site Planet Steel Express) announced that they have partnered with Rick to bring this design to life via a crowdfund campaign. 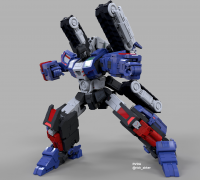 This figure, should it reach it’s goal, will stand at 11 inches tall (to go toe to toe with MMC’s Overlord), have his signature patented leg-guns and will transform into a tank like his comic book inspiration. Crowdfunding is taking place now and Mastermind Creations’ intent is to release the figure in February of next year. You can check out the images of this not-so-big city bot and get the crowdfund details after the jump. Via 十条大楠 on Weibo, we have images of the colored prototype of the upcoming Toyworld: TW-FS01, based on The Last Knight WWI Bulldog. Toyworld brings us a representation of a character with a brief moment on The Last Knight film, but who got attention of fans for his original alt mode. This old robot was one of the veterans who was under the care of Sir Edmund Burton. He transformed into a 1917 Mark IV tank “Bulldog” from World War I.
Bulldog is made in scale with popular Studio Series line (seems like a Voyager class). As we can see from the images this mold is full of details in both modes, with great finishing and painting. You have several interchangeable display options for the head: regular face with military hat or helmet, and two different battle masks. There’s no specific information on price or release date, but be sure to check our Boards for more information when it’s available. You can now check the images after the jump and then sound off on the 2005 Boards! Via a post on Zeta Toys Weibo to celebrate the Chinese New Year, they have also revealed the first sketch of their next project: G1 Predaking. Zeta’s approach to the Predacon combiner seems to be based on the blocky G1 cartoon style of the characters. This may be good idea or not, depending on your preferences. We are yet to see proper renders or prototypes, but so far we have an imposing Predaking. We still have no specific information on release date, or the individual modes of the Predacons, but stay tuned with TFW2005 for more updates. Click on the bar to see the images and join to the ongoing discussion on the 2005 Boards! Via Baidu user 幻光 and Toyworld Weibo we have images of the color prototype of TW-F01 Knight Orion, Toyworld’s take on Age Of Extinction / The Last Knight Optimus Prime. This is our first look at the next alternative to the last design of Movieverse Optimus Prime. The sample shows off a great finishing and painting details. We are yet to see the colored alt mode, but we are sure your optics will be pleased with the images attached to this news post. This figure is expected for release on April 2019, but you can pre-order it now via our sponsors below. Click on the bar and share your impressions on the 2005 Boards! Via Mech Fans Toys Weibo we can share images of the gray prototype of the new Mech Fans Toys MS-19 Flame Commander (Legends Scaled Rodimus Prime). The Legends scaled market is sure very competitive and brings us impressive small figures, and this new release of Mech Fans Toys is no exception. Flame Commander stands only 12 cm. tall, but it can transform into a cartoon accurate Rodimus Prime with an opening chest with a Matrix, and the alt mode can split into the front car (Hot Rod style) and a trailer which can convert into a battle station for the figure. To top it all, it includes the following accessorizes: 2 guns (can combine into a bigger one), a buzzsaw, and even Hot Rod’s Targetmaster partner Firebolt. No specific release date or price at the moment, but you can click on the bar to check out the images on this news post, and then sound off on the 2005 Boards!